Farm Animals is the first book from our toddler series. It introduces the kids to some new friends from the farm. The simplicity and warmth of the design and the colourful illustrations make this book stand out from the crowd. The friendly artwork has rich potential for production of series of activity games for toddlers, such as colouring books, memory games, peek-a-boo, find the differences etc. 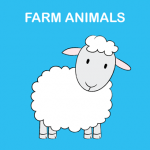 The mobile app Farm Animals – Activity Book is highly Ranked in Apple App Store’s Top 100 in over 80 countries, including the UK and the US for Educational and Kids Games for iPhone & iPad.